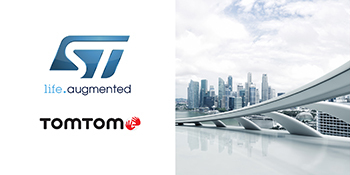 STMicroelectronics (NYSE: STM), a global semiconductor leader serving customers across the spectrum of electronics applications, and TomTom (TOM2 ), the leading independent location technology specialist, today announced a package of development tools in the STM32* Open Development Environment that connect directly to TomTom Maps APIs (Application Programming Interfaces) for location, tracking, and mapping data services, accelerating product development and reducing time-to-market and development costs for developers. This first-of-its-kind-development package consists of an STM32 Discovery host board for 2G/3G cellular-to-cloud connectivity, a GNSS expansion board based on ST’s industry-proven Teseo satellite navigation technology, and a software Function Pack that connects your Internet-of-Things (IoT) node via a cellular network to a range of TomTom Maps APIs. With this hardware and software package and a TomTom developer account, developers can quickly add location-based services to their IoT and Smart City applications. Among these services are the translation of GPS coordinates into a street address inside a map (Reverse Geocoding), retrieval of nearby point of interests, and the production of accurate navigation directions. In addition to the STM32 family of Arm® Cortex®-M core microcontrollers, the development tools leverage ST’s market-proven multi-constellation Teseo positioning-receiver technology to perform all positioning operations including tracking, acquisition, navigation, and data output. *STM32 is a registered and/or unregistered trademark of STMicroelectronics International NV or its affiliates in the EU and/or elsewhere. In particular, STM32 is registered in the US Patent and Trademark Office. Arm and Cortex are registered trademarks of Arm Limited (or its subsidiaries) in the US and/or elsewhere. We design and develop innovative navigation products, software and services, that power hundreds of millions of applications across the globe. This includes industry-leading location-based and mapmaking technologies, embedded automotive navigation solutions; portable navigation devices and apps, and the most advanced telematics fleet management and connected car services. In 2017, the Company’s net revenues were $8.35 billion, serving more than 100,000 customers worldwide.